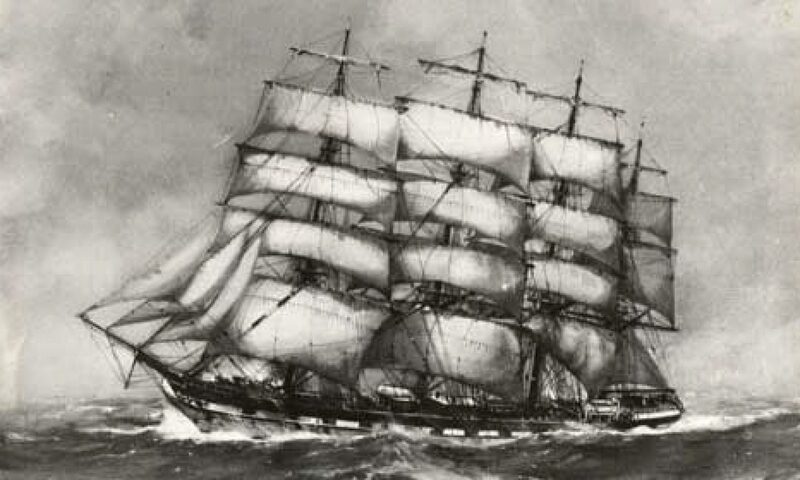 R&J Craig started tentatively in business by purchasing a second-hand wooden-barque named Majestic (launched at Greenock in 1846). By fits and starts the firm grew by acquiring new bigger ships trading initially to Bombay, and onto Calcutta in India. The growth and prosperity of these Indian cities was matched by Cardiff and Dundee in the Great Britain, when Glasgow was the prosperous ‘Second City of the Empire’. Then R&J Craig make a major, high-risk, investment: they decided to launch a new format of ship: it was the revolutionary, and large, iron 4-mast County of Peebles launched in 1875. County of Peebles (Ship No.71742) proved to be an overwhelming success, and was a major milestone in maritime history – being the first iron 4-masted merchant ship. It was followed by a series of further brilliant iron clippers launched from the Barclay Curle shipyard on the River Clyde. Full-rig, iron, 4-mast ship County of Linlithgow, launched 1887 (Ship No.93380). The fate of each of Craig’s once glorious 4-masters has been re-discovered and graphically described in the book.